You're IT Ridgefield Bicycle Company! Three questions with Jacqui Dowd, owner of Ridgefield Bicycle Company. We started our business because we wanted to be a bigger part of the Ridgefield community and to do it on bikes, we couldn't resist! We employ three full-time mechanic/salespeople, one year-round part-time mechanic and four to five seasonal employees, plus us the owners, Sean and Jacqui. We work with some of the most talented, smart and generous people we have ever met. Ridgefield Running Company, Ancona's Wine & Liquor, Elevation Spin, The Ridgefield Playhouse, Sarah's Wine Bar, Neumann Real Estate, The Cake Box, SusiLaura Massage, Southwest Cafe, Tusk & Cup and Ridgefield Physical Therapy to name a few. Ridgefield Bicycle Company is located at 88 Danbury Road in Ridgefield. Visit them online here. 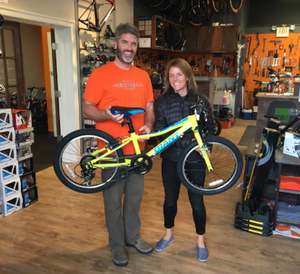 Ridgefield Bicycle Company tags Megan Searfoss, owner of Ridgefield Running Company!